Training for Basic of Supply Chain Management by APICS by MPM company in last year were provided in 2 separate 3days training. Education, discussion, business cases were well prepared, adjusted and tailor made to our daily reality. Three days training was facilitated very professionally in very open and supporting atmosphere from Mr Konrad Grondek (MPM Trainer). 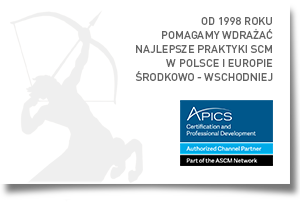 Biggest advantage of this training we see in calibration APICS standards with our company reality, possibility to discuss, calibrate, conclude and increase competence of participants. We initiated several improvement activities in Need Planning and Inventory based on this education. At last not least, we see that Basics of Supply Chain Management based on APICs standards shall be part of knowledge of everyone working in Supply Chain.